High quality, high reliability, high performance borates. For over a century, U.S. Borax has been mining, refining, and transforming boron into 20 Mule Team® Borax products that are essential to modern living. Yet we’re anything but old fashioned. Our scientists and technical experts, in concert with industry, community, and educational leaders around the globe, continually study, develop, and support new and better ways to put boron and borates to work. Along with our parent company, Rio Tinto, we’re committed to pure, refined products; responsible, safe operations; and sustainable development. 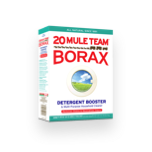 Looking for 20 Mule Team Borax laundry detergent? The Dial Corporation acquired U.S. Borax’s consumer products division in 1988. Subsequently, Henkel acquired Dial in 2003.